Mini in the (school) house! Mini started preschool on Monday. She was due to start with everyone else on the 29th of August but got delayed due to holidays in France, which of course had to be taken at the end of August-will have to review that scenario if she starts school next year! I can’t believe she’s started preschool already. I’m at a loss as to where the last three and a half years have gone. The preschool is the same place where she had her trial in June so it wasn’t a whole new alien world to her and she happily bounded straight out into the yard, unlike some of her peers who had to be released from their limpet like grasp on their parents’ legs. The preschool is a Steiner one where a lot of emphasis is placed on nature-the kids go for walks, and learn all about their environment. They do baking and chop vegetables for their own soup, they sing and dance. I’m delighted she’s there as it seems like a really good fit for her and she seems to be delighted too. We have also managed to secure funding for a pre-school assistant for 3 hours a week who will help her to settle in-kind of like a precursor to a special needs assistant, except actually better as it’s a one on one scenario. 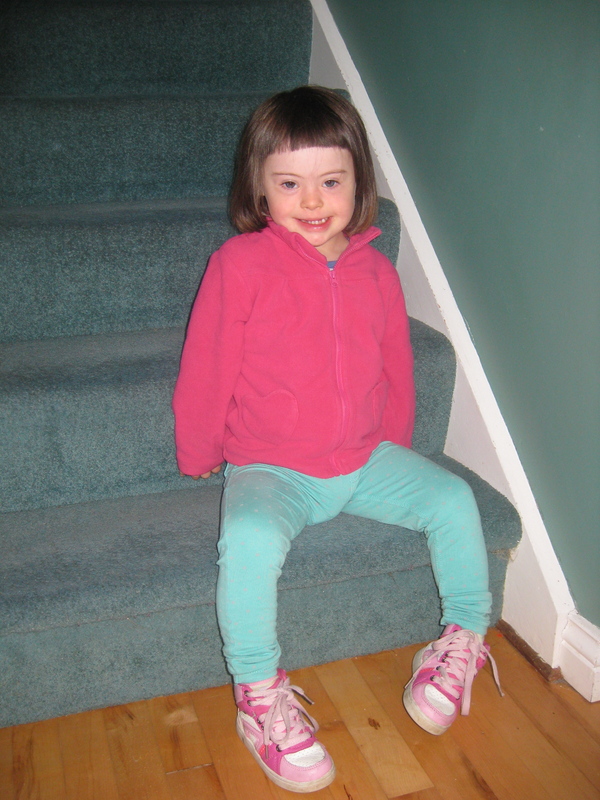 We’ve employed someone to fill the role-a lovely lady who was an assistant in the preschool last year but had her hours cut this year-and are paying extra to have her for another three hours so Mini gets 6 hours one on one help a week, which is fantastic and definitely not something other kids with Down syndrome are getting so we feel very lucky. It’s gotten me thinking though about whether or not a mainstream school is the right option for her.Special needs assistants are being cut left right and centre. The ratio of pupil to SNA is greater now than it has been since their introduction into this country’s education system. I had always thought-mammy ego and pride aside-that Mini would be more than capable of attending a mainstream school rather than a special one. And I loved the thought of the two girls attending the one school and being able to support each other throughout their primary education. Now, however, I really have to look at what will be the best option for her. She’s a bright spark and a sociable being but these attributes might not be enough to make her happy in an environment where her all of her peers will be ahead of her both emotionally and developmentally. 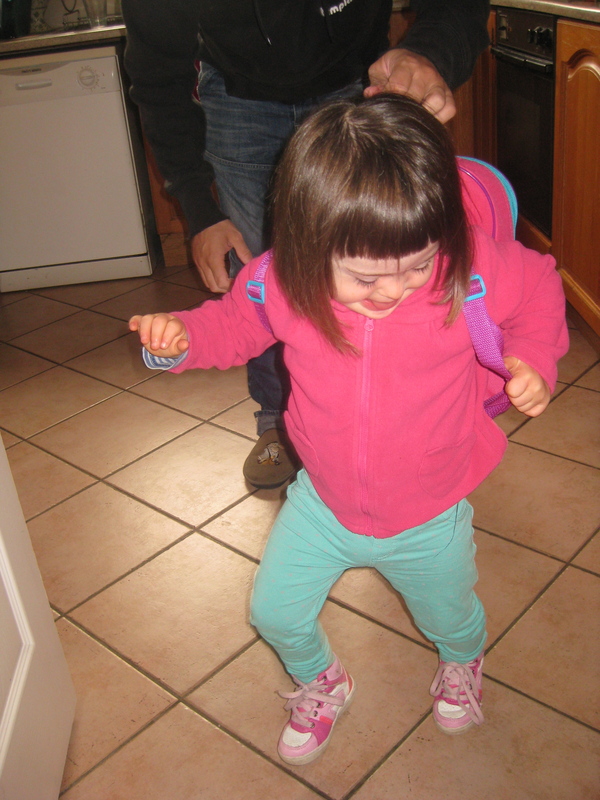 Dancing out the door to preschool. I notice the difference straight away in relation to the other kids in the preschool. Language is a common bond that ties them and as Mini does not speak that much, I see her being left to the side and excluded from games. It’s not being done with any malicious intent, it’s just the way kids are. They look for a response, if they don’t get it, they move on to someone else who can respond to them. I want Mini to be happy and included and build good relationships with her peers. Lifelong friendships are forged in the school yard and I want her to have the same opportunites as others to build these important relationships. So a school where she is on a par with her peers developmentally might be a better option. We’ll have a better idea if she is ready for school and whether or not it will be mainstream or special during the months to come and whatever road Mini travels, I know she will continue to make us proud. I’m linking up this post with the always inspiring Small Steps Amazing Achievements and the wonderful Pulling together for Team 21. Well done Mini! That’s great that she trotted off happily. The leg-hugging part is definitely the hardest – that was me last year, although the twins thankfully alternated their days of leg-hugging! I’m sure when the time comes you’ll make the best decision for Mini but I can appreciate how it’ll be difficult for you. Thanks-it’s so hard to know what the right decision is sometimes! What a great start, fantastic to read. The SN versus mainstream school is a massive decision and one that we ummed and aaahed about for D. It all depends on the individual child, good luck. Thanks so much.We ve a lot of thinking to do over the next year. Thank you Hayley and thanks for hosting!